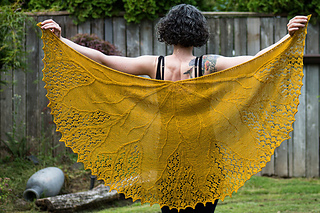 This shawl is worked from the top down, center out, increasing every 6th row through the charts. 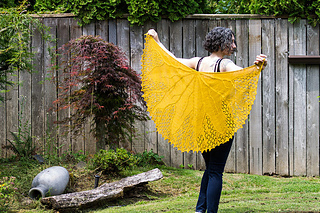 The shawl will have 7 segments total making it slightly larger than a half-circle shawl. 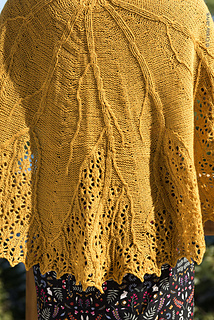 This pattern is designed to minimize yarn waste, regardless of gauge or available yardage. If you run out of yarn before finishing Chart C, simply bind off when you have only enough yarn to do so. 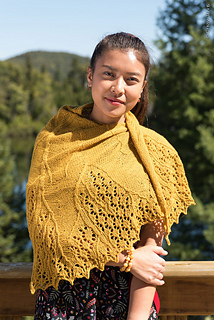 If you have sufficient yarn to continue past Row 141 of Chart C, work a WS row and then continue on to the optional Continuation Chart, being sure to leave enough yarn for the Stretchy BO which uses approximately twice the yarn of a normal bind-off.